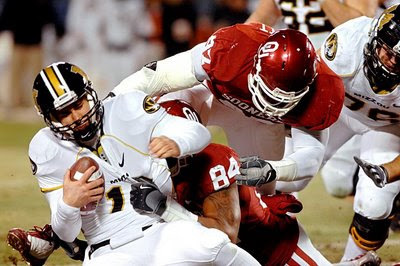 On the final day of the year, that debacle of an Oklahoma Sooners football season known as 2009 left one last parting gift – a gruesome leg injury for defensive tackle Adrian Taylor. Taylor and all-world DT Gerald McCoy teamed up last season to form a potent tandem on the defensive interior. With McCoy destined for a high spot in the NFL draft, the plan was for Taylor to take over as the foundation of OU's 4-3 D this season. That was the plan before New Year's Eve, that is. Now, Taylor's injury in the Sun Bowl makes defensive tackle one of the single greatest areas of concern for the Sooners this year. Taylor still plans to play this fall, and he's already going through drills. Still, anyone who expects him to be a force up front should try to imagine what it would be like trying to play football after having your foot re-attached. The uncertainty puts the onus on touted sophomore Jamarkus McFarland to grow up quickly. McFarland occasionally made it on the field during his freshman year to spell Taylor and McCoy. Even though he was projected to start, the need for the talented lineman to step up his game has taken on greater importance. Assuming Taylor can't go full bore on Sept. 4, look for big sophomore Casey Walker to get the starting nod next to McFarland. Walker brings plenty of girth but far less production to the table. Muskogee's own Stacy McGee also should see time in the tackle rotation. Taylor's injury probably would have left the coaching staff far more anxious had stud defensive end Jeremy Beal opted for the NFL draft in the spring. Beal is entering his third year as a starter and could be in line for a huge campaign if he continues on his present trajectory. Last season saw his sacks, tackles and stops for loss all increase from '08, and he did so playing one fewer game. Of course, the loss McCoy looms large over Beal as well. With McCoy out of the picture, Beal will be the one commanding the opposing offenses' attention. It could be the case that even if his play improves, Beal's stats will decline. Big Frank Alexander returns for another season as Beal's bookend. As evidenced in the Bedlam game two seasons ago, Alexander can change games coming off the edge. However, the mammoth Louisianan suffered through somewhat of a sophomore slump in 2009. Although Alexander appears to have the physical tools to be a high draft pick, he'll need to start showing more consistency if he wants to capitalize on his raw ability. A host of talented youngsters are waiting in the wings should give Alexander reason to stay sharp. Sophomore David King filled in capably in spot duty last year, including some solid play in the bowl game. A favorite of the coaching staff, look for King to see his fair share of snaps this year. The outlook for King's touted classmate R.J. Washington is far less clear. At this point, it seems like Washington's spot on the DE totem pole can't be dismissed as a mere motivational ploy. A beast like Gerald McCoy only comes around every so often, and a big-time defensive tackle in that mold makes everything easier for his teammates. There's no one on the Sooners' roster who can replace McCoy's presence in the middle. The uncertainty surrounding Taylor just magnifies that loss. So, OU fans shouldn't expect the front four to dominate opponents in the same fashion as last season. The bright side, however, is that the defensive ends are experienced all-around performers. OU should make out alright if the guys on the interior can just stand their ground. This season, that should be good enough.